Washington – Hillary Clinton spent four years in Connecticut – turbulent years caused by unrest over the Vietnam War and racial strife. But for the future first lady, U.S. senator, secretary of state and presidential nominee, they were also formative. 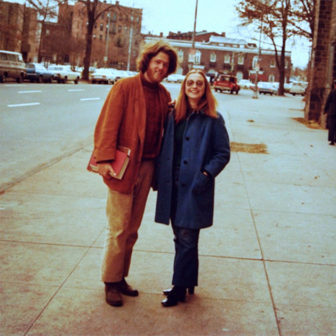 Clinton not only met her future husband here, at Yale University, but formed long-lasting relationships, some of which helped both her and her husband in their political careers. When Clinton began law school at Yale in 1969, her reputation preceded her. She had made a national splash with her commencement speech at Wellesley College a few months before —the first by a student – talking about her generation’s quest for liberation and commitment to dissent. She also stood out as one of the few female students at the law school, where only about 15 percent of her class were women. Sen. Richard Blumenthal, D-Conn., a strong supporter and surrogate for Hillary Clinton, was also in that class. Although Hillary Clinton was “warm and charming,” she was “more difficult to know” than Bill, Blumenthal said. Donald Pogue, appointed by Bill Clinton to the U.S. Court of International Trade in 1995, also met the Clintons at Yale Law School. His position as a judge on the court proscribed him from being interviewed. But his wife, Susan Bucknell, who met the Clintons through her husband, remembered several visits by the Clintons to their home at Fort Trumbull Beach in Milford. “They were clearly electric together; there was such synergy,” she said. Of Hillary she said, “She was just one of those people you would warm up to,” and is frustrated by what she says is the media’s depiction of the candidate as standoffish and aloof when it comes to the public. Bucknell said the conversation during the Clinton visits centered on politics. “It was a very political household,” she said. She also said Hillary Clinton made it clear her vocation was helping children. Bill Clinton began his law school career in 1970, a year after Hillary. But she took a year off to work at the Yale Child Study Center. Former classmate Nancy Bekavac, now retired from her position as president of Scripps College, said she met Bill Clinton first, well into the semester in November, when he introduced himself and asked for her class notes. She said she was perplexed because she had not seen him in class. “I did not recall ever laying eyes on him,” she said. Bill Clinton told her he hadn’t been attending classes because he had been working on Connecticut Democrat Joseph Duffey’s unsuccessful bid for the U.S. Senate. “There weren’t that many women at the law school, so we were thrown together,” she said. Bekavac said she had heard about Hillary before she had met her, because of the national stir she made with her Wellesley commencement speech and through Reich, a mutual friend. “She was diligent and outspoken, but almost all the women were outspoken,” Bekavac said. She and the Clintons traveled to Washington, D.C., to protest Richard Nixon’s inauguration and were dismayed at the mess the other protesters made at the Lincoln Memorial. They asked the National Park Service officers if they had any brooms, were directed to a janitor’s closet, and started sweeping up the debris, Bekavac said. “I can still see Hillary cleaning up the Lincoln Memorial. She came to protest and ended up pushing a broom,” she said. Bekavac said Hillary stayed connected to the people she met at Yale. Like Bekavac, another classmate, Carolyn Ellis Staton, professor emeritus at the University of Mississippi School of Law, knew about Hillary Clinton before she met her. Staton said she met Hillary Clinton at the law school library. Staton said Hillary Clinton had a “great deal of confidence” and was friendly and outgoing. Staton added that in the early 1970s, there were few “models to aspire to,” very few women in politics. Like Bekavac and others who met the Clintons in Connecticut, Staton continues to stay in touch. She was invited by Hillary to join her at a fundraiser in New York City last month that featured a special performance of the Broadway hit Hamilton. “I would never have gotten to see Hamilton,” Staton said. The relationship between the Clintons and one of the friends they made in Connecticut has come under media scrutiny. Duffey, whom Bill Clinton appointed to head the U.S. Information Agency, was among those who donated to the Clinton Foundation and received special access to the State Department when Hillary Clinton was secretary of state. Duffey was hired in 1991 as vice president of Laureate International Universities, a group of for-profit schools. He donated between $10,000 and $25,000 to the Clinton Foundation and was one of 20 people at a higher education policy dinner with Hillary Clinton in August 2009. Her e-mails indicate she told her staff to invite Duffey. The following year, Laureate International University entered into a five-year agreement with Bill Clinton to serve as honorary chancellor of Laureate International Universities. The school paid the former president $17.6 million in compensation. Laureate spokesman Adam Smith said Duffey, who still works part-time for the school, would not be available for comment.